We get it! You would rather be out hunting. But every now and then (when the weather or time is against you) you have to resort to the next best thing – losing yourself in the glory of a fellow hunter’s stories! With that in mind we have tracked down 59 of the best hunting websites and blogs packed with videos, pics, stories and podcasts to take your mind where your body can’t be – into the wilderness on a hunt. Here is our list of hunting bloggers and they are in alphabetical order and whether you are a deer hunter, trophy hunter, beginner or expert, there is something for everyone. Jon and Gina star on the Outdoor Channel and their website has a huge gallery, blog posts and show episodes. They also have regular competitions with some great prizes to be won. Remi stars in The Apex Predator on the Outdoor Channel and his website is primarily based around his popular show. He is also a co host on Solo Hunters. You can find out a bit about Remi and his show or you can buy his episodes. Banded Nation specialize in producing waterfowl hunting gear and nationally syndicated hunting tv shows including waterfowl hunting and predator hunting. Bone Collector has a lot of great content on its blog and the guys have their own show at Bone Collector TV. They even have a live deer cam which is pretty awesome. Not too hard to work out what is on this website, its another hunting network site and has a lot of great info on all things bows and hunting. There is a blog, videos, resources and more. Also a very solid social presence on Facebook and twitter. Bow Hunting Freedom is mostly dedicated to the popular bow-hunting/outdoor industry career podcast that Philip does, you can access the podcast from his website. A very popular bow hunting website that has tactics, reviews, how to’s and much more. This website is part of the outdoor sportsman group. With a tv show on the Outdoor Channel these guys have a large following. The website has videos, photos, hunting gear, outfitters, safety and more. Another very popular hunting website and magazine, these guys have plenty of great resources on all things hunting and have contests as well. Another popular website that has plenty of videos, posts and much more on hunting. There is also recipes, news and much more. Deer Hunter is a hunting site with a lot of content, it is part of the huntingnetwork.com network of websites. Plenty of good information available here including tips, gear, videos and more. A good amount of information on deer hunting and bow hunting. Some photos and videos also. This website is definitely worth a look, particularly if big bucks are your preferred prey. This website has stacks of posts full of helpful information. Josh also has an extensive list of the gear he uses which could be useful for beginners. On Kari’s blog she has some great tips, a few product reviews and some great stories of her personal hunting experiences. If you are interested in turning your hunt into a gourmet feast, be sure to check out this website. Driven Hunter is the husband and wife duo Pat & Nicole, these guys have a great blog, lots of great photos and a handy list of outfitters. Do they look a little familiar? You have probably seen these guys on the Outdoor Channel. Having written over 10 books and more articles than most in a lifetime, Ken’s blog has good content on deer hunting and beer hunting. He also has plenty of DVD’s and books to keep you busy. Not too difficult to work out what this website is about, probably the Internets biggest resource on hunting ducks and also the conservation of them. They are also incredibly popular on their social channels. A hugely popular hunting, fishing and survival magazine and website with a large social following. A plethora of information for the outdoor enthusiast. If you are serious about your hunting, subscribe to this website! A great site with information on fishing and game hunting including ducks, coyotes, deer and more, this site is also part of the outdoor sportsman group of sites. Lots of great stories and articles on all forms of hunting to keep you busy for a long time, they also have an outfitter directory. Plenty of great giveaways each year too which is great. If you are wanting to go hunting and don’t know where to go then this is the website to go to. They have a huge hunting directory and can organize your next hunting trip for you. They also have reviews, tips and a podcast. A quality website on hunting in general with lots of news and reviews. Kevin is active on on his social media channels so make sure you connect with him via the links on his website. Hunting Net has a classifieds and an active forum which is great, there is also a list of outfitters for your convenience. They also have plenty of articles, tips and recipes. These guys film authentic hunts of whitetail deer and elks. These hunts are carried out with bow hunting equipment. Not for the feint-hearted! A top website on bow hunting that has hunting optic reviews, how to videos,and much more. There are even some great recipes on here for all the avid hunting chefs. Jim hunts around the world and you can see him on the outdoor channel. There are some great videos on his tv shows page and also some great ones on the outfitters page. Possibly one of the most well known hunters and hunting bloggers around with his TV show “Uncharted” on the Outdoor Channel Jim Shockey has done it all. Just reading the about page on his website is enough to make most men feel a little envious. Julie is a shooter and hunter and has been featured on the Outdoor Channel. You will find images, videos and even a podcast on her website, and she has even a few books under her belt. Lowell is not only an avid hunter but a great photographer as well. His website has some great posts on it with amazing images and he also has some great recipes to check out. Melissa has a show on Sportsmans Channel and Wild Tv. There are plenty of hunting pictures and fishing pictures you can check out, and you can see full episodes on her website. The also has quite a few posts on hunting. Michelles website has some articles on different types of hunting, some reviews and some delicious recipes. Her motto is ‘Hunt, Fish, Repeat’. Need I say more? Chock full of hunting tactics, reviews and news, a great website. Mike also stars in the TV show Big Deer TV, has the blog bigdeerblog.com and is active on social media. Dedicated to active duty military and veteran members, this website has a thorough listing of state regulations for fishing and hunting. They also cover hunting news, reviews and some giveaways. Brigham’s blog is great if you like the storytelling side of hunting, he goes into great depth to write about all his fishing and hunting trips. A huge resource of stories and news related to hunting and the outdoors. There is plenty to read about on fishing, shooting and survival and even a bit in there on power sports. Hugely popular outdoor website that has info on hunting, fishing, weather, survival and more. These guys also put out a magazine. Carrie runs this podcast on all things hunting and outdoors. Great for those who prefer the spoken word to the written! You can even submit your own podcast! Randy is the host of Fresh Tracks TV and founder of Hunt Talk the podcast. No blog that I could find but you can purchase plenty of DVD sets of his TV series which might make a great present for the hunter in your life. Realtree is a huge online hunting resource that covers deer hunting, turkey hunting, bow hunting, game hunting and much more. They have a huge online store to purchase all manner of hunting products. They also boast one of the largest online hunting followings out there. It is well worth reading the company history page here to see how this business came to be. An author of multiple books and writer of many hundreds of articles Scott Haugen is a man on a mission. His website has a great blog on it and you can pick up his DVD’s, fishing and hunting books from his online store. Shooting Time has a lot of great in-depth information on bow hunting, there are plenty of reviews of different products and even a forum. Jana stars on The Sportsman Channel with her hunting, fishing and adventure show. Her website has news, merchandise and episodes of her show. Al’s website contains a lot of posts of his personal experiences hunting or testing equipment such as hunting optics. The reviews all seem thorough and genuine which is great and there are a lot of resources on the site. Mark has a passion for the outdoors and bow hunting in particular, he has a huge amount of information on his website on gear to use, hunting tips and so much more. One mans journey from ‘Fat Boy to Elk Hunter’. This is a great blog that has well written hunting stories, recipes, book reviews and much more. A popular website that has a mixture of posts & podcasts on all things hunting. With a name like ‘The Meat Eater’ it comes as no surprise that you can find some great, meaty recipes here too. Steven Rinella also hosts http://meateater.vhx.tv/ and is active on social media. Will’s blog is about his hunting experiences and learning from others to become a better hunter. You will also find some reviews and Guest Posts on this website. Michael’s blog is all about his hunting experiences which include fishing, rabbits, deer and more. There are a stack of great articles here! It does not matter if you are a dove hunter, fisherman or deer and big game hunter, this website has you covered. Lots of videos, posts and great information on all things to do with hunting and the wilderness. They have a very solid following on Facebook and Twitter also. Great hunting website on predominantly deer hunting that also has a popular podcast. A top quality site for deer hunting strategies and gear. These guys have a great following on Facebook and Twitter also so be sure to follow them. A great blog with some highly talented women hunters. These ladies are creating a community that provides information, opportunities, and products specifically for women, by women. Womens Outdoor News is chock full of great tips and adventures on hunting, fishing and adventure in general. These ladies don’t hold back and there is plenty of great information in here for all. If you want to go turkey hunting then look no further, these guys specialize in it and have the hunts listed on their hunting website. Neils website is a big blog about his hunting trips, he has been writing for years and years about his experiences which cover most forms of hunting but predominately duck hunting. 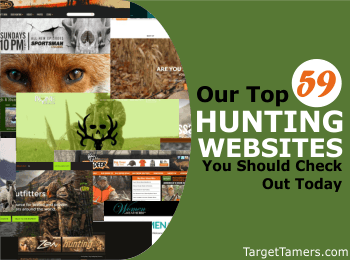 So there they are, my top 59 hunting websites! Do you have a favorite that hasn’t made my list? Please let me know in the comments below, I would love to check it out! If you like this post, please share it with your hunting buddies.